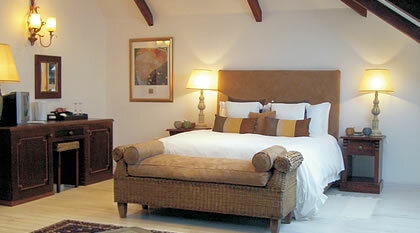 Le Ballon Rouge, Franschhoek Accommodation. 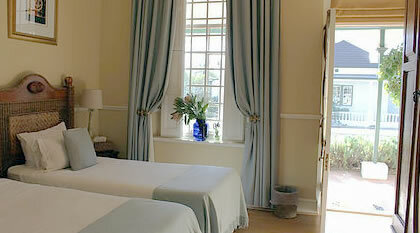 Relax your senses at Franschhoek's oldest guesthouse, Le Ballon Rouge. Originally built in 1904, you'll be just steps away from the historical heart of the village. And on the doorstep of world-class vineyards. 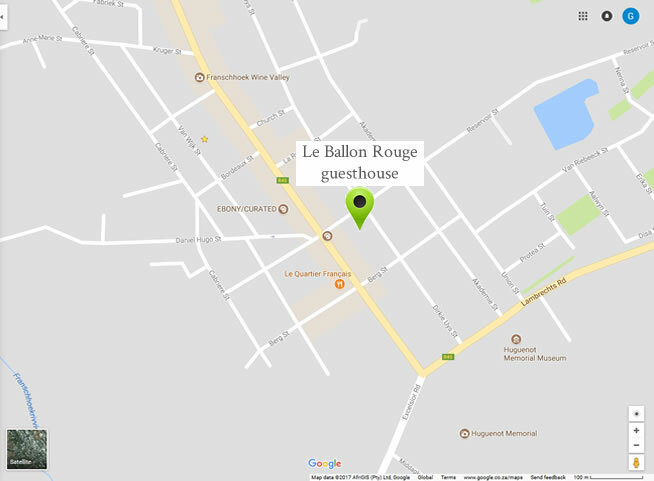 Le Ballon Rouge is your ideal base for exploring the wineland's culinary (and other) wonders. Choose from our lovingly restored rooms: eight individually appointed doubles and two decadent suites, one with a huge deck and private Jacuzzi. Breakfast on the terrace while you plan your day's adventure, even if it's nothing more strenuous than lounging by our sunny pool with a book, or taking a stroll to sip the region's wine. 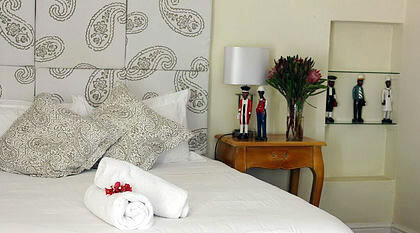 Welcome to your personal piece of Franschhoek. Wake up in complete luxury to fabulous views of the mountains in our spacious private suite. The suite features a seperate lounge with comfortable sofas, a desk and your own private bar. Another superb feature of this suite is your own personal jacuzzi on the private roof deck. The kitchenette completes this fantastic suite combining privacy with the benefits of hotel service. Feel the tension fade away as you sink into this huge downy bed. This, our second suite features a spacious and comfortable seating area, an antique stlyed bathroom of great beauty and loft windows with magnificent vistas of the mountains. 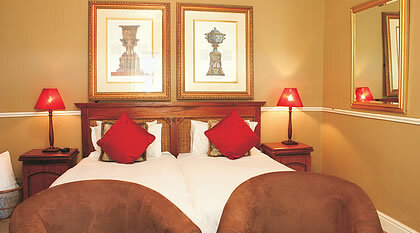 If you are travelling as a family, children can be accommodated in this suite. Just contact us for arrangements. 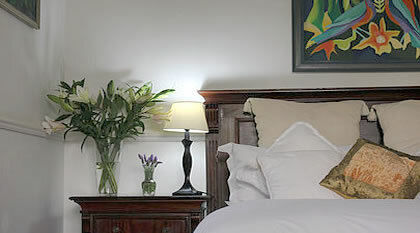 With decor in neutral tones this delightful double room has an aura of space and light. This comfortable room features armchairs where you can relax after a busy day exploring the village. It is also just a few short steps away from pool terrace. The room also features the owners collection of West African Sculptures. Nestled down a path, lined with trees nearby the pool this lovely room, styled with rich red decor is a light and spacious nest indeed. Complimentary toiletries and fluffy towels complete the barthroom. With warm light pouring in through the windows, this room has an atmosphere that is both fresh and dreamy at the same time. 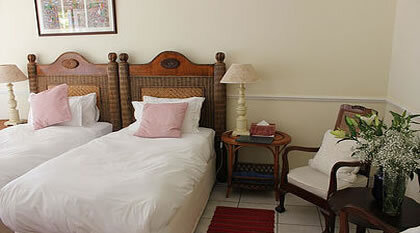 The room features two wicker beds from Bali found during the owners many travels. They can be arranged as twins or as a double bed. The room is situated next to the pool terrace, an ideal placement during the hot summer months. Step back in time in this room with high ceilings and door leading out onto the wrap around verandah. This room features a gorgeous bed made of solid teak with delighful painting by Mary Collis, one of Kenyas leading whimsical artists. The spacious shower is tiled with marble for you to luxuriate in. In the mornings the room is filled with delighful sunshine as you fling open the curtains. A beautifully styled room with touches of red, the exqusite orginal doors lead out the the sunny verandah, where you can relax and view the village life, surrounded by flowers and bees. 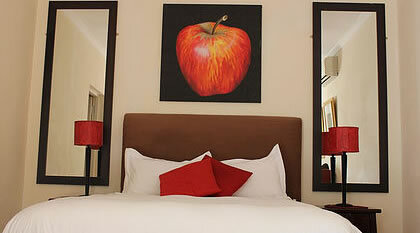 The room features twin beds that can be arranged seperately or as a double bed. Enjoy the complimentary toiletries and fluffy towels in the en-suite bathroom. A wonderful room styled in white with touches of red, and with high ceilings and plenty of light shining through the windows. 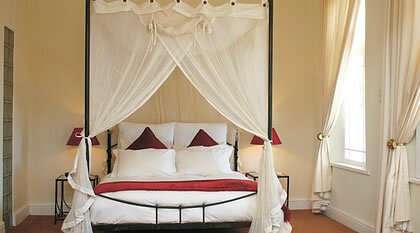 This room features a magnificent four poster bed and an olde world styled bathroom for you to enjoy. This room is ideal for the romantic at heart. A popular room at Le Ballon Rouge with its soft pastel colours, this elegantly styled room features tall windows with the sunshine streaming in. 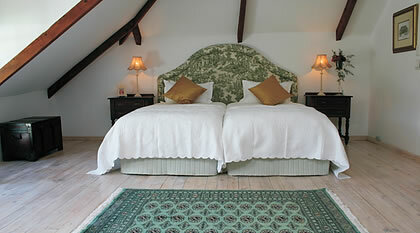 The room features twin beds and a spacious tiled bathroom. A door leads out onto the sunny verandah where you can relax as you watch the village life go by down the historical street. A wonderfully styled room with pleasing colours and decor designed for relaxation. 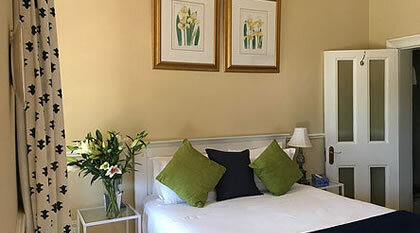 This room features a double bed, spacious en-suite bathroom and a door leading out onto the verandah where you can watch the world go by before setting off to explore the delights of Franschhoek. 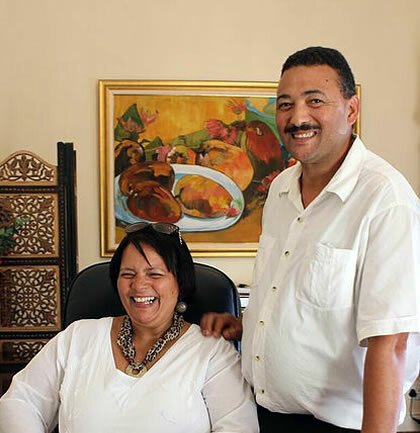 A warm welcome awaits from husband and wife management team, Jenny & David Hofmann. As Franschhoek locals, they know all the hidden secrets of the village to help make sure you have a wonderful stay at Le Ballon Rouge. David runs bespoke tours, so be sure to ask him what remarkable things you can explore with him in the region. Jenny is an expert on what to see and do and is always happy to recommend somewhere delicious to have a bite. Contact Jenny on our contact info below with any questions you have & she will be in touch! Visit our website for more information, images and other details on the link below in the contact section. For online booking visit our website!